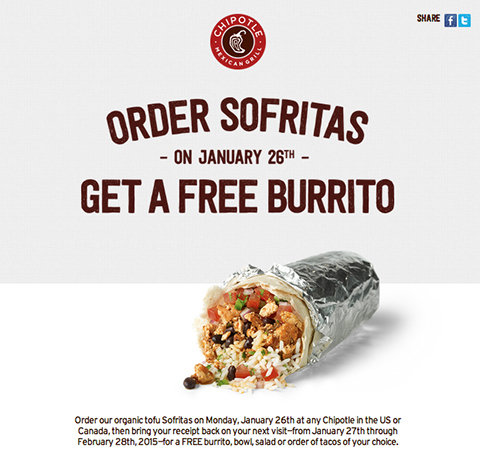 Is this an elaborate ruse to finally get people to order sofritas? FOH. Chipotle stopped serving pork at hundreds of restaurants yesterday after suspending a supplier that violated its “responsibly raised” standards. People are panicking, and calling the carnitas shortage a pork-ocalypse. This is the first time in the history of Chipotle that the company stopped serving a topping for its burritos and bowls. Arnold said the company learned of the violation by the pork supplier on Friday through a routine audit, and that most of the issues related to the violations concerned the housing for the pigs. Those who readily subscribe to conspiracy theories might think this is nothing more than a marketing ploy for Chipotle. Are you sitting there right now thinking: Damn, Chipotle is a stand-up company with high ethical standards and a focus on sustainable farming practices? Exactly. We hope that’s not the truth, since withholding a nation’s carnitas is very un-American. That is not happening with the carnitas, however. “In this case, we won’t make that kind of substitution,” Arnold said in an email to AP. Carnitas-worshipping Americans are obviously not happy. “We did suspend a pork supplier after a routine audit showed some inconsistencies with our protocol. Under our standards, pigs are raised with access to the outdoors or in deeply bedded barns and without the use of antibiotics. Because of this suspension, we have a shortfall in our pork supply and are currently not serving our carnitas (which is pork) in about a third of our restaurants.